The first day of winter dawned beautiful here in Lake Placid. The moon was still up when I got up this morning, but I couldn't get a good photo of it reflecting off the icicles hanging in front of my windows at home. 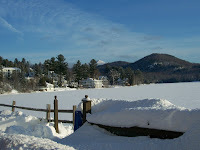 Instead, you get this photo of early morning Lake Placid, on Main Street overlooking Mirror Lake. Here is a link to a collection of photos I took this morning. You can see Whiteface Mt. poking up through the clouds. Naturally, ski conditions at Whiteface are simply outstanding. Holiday visitors, skiers, and resort home owners are arriving, and the Village of Lake Placid is hopping. There is so much to do here, I can't imagine I am going to garner much sympathy when I say it is tough to decide what to do today. So many choices, so little time! For example, when I leave the Prudential Terry Horrocks Real Estate office where I work, I have to decide whether to rush over to Whiteface, or cross-country ski train at Mt. Van Hoevenberg (MVH), or chill out with a mini back country ski. Since I am so incredibly behind on my holiday preparations (it is too late to get done early), I will most likely just do a x-c session at MVH. But if you are thinking of getting away for the holidays - the Adirondacks and Lake Placid have plenty to do to keep you from getting bored and eating too many holiday cookies. Happy first day of winter - here's to a good one!